Divergent Fan Party on Sat. March 15th from 2-4 pm with great giveaways! Greenville, SC, March 3, 2014 - Fiction Addiction and Summit Entertainment invite you to a Divergent fan party at Fiction Addiction on Saturday, March 15th from 2 - 4 pm. This event is free and open to the public. The film starring Shailene Woodley, Kate Winslet, Theo James, Ashley Judd, Tony Goldwyn, and many many more will hit theaters March 21st. To celebrate the release, Summit Entertainment is sending us Divergent t-shirts, hoodies, sunglasses, tote bags, tattoos, pins, posters and advance screening passes! Come out and join us and meet other fans! View the Divergent trailer here. If you haven't read the book yet, stop by and pick up a copy so you can read it before you see it! 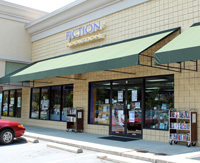 ABOUT FICTION ADDICTION - Fiction Addiction is a local, woman-owned, independent bookstore established in 2001. The store carries a mixture of new and used fiction and nonfiction, including children's books, as well as gift items. We have recently moved to a new, bigger location at 1175 Woods Crossing Rd.